Sorry I have been so absent lately, I just have so much going on! 2. Tangerine Tango ends in 16 days! There is so much activity going on over in the Flickr group. I adore ALL of the entries so far! Here's a small sampling of what's going on over there. 3. Patterns! 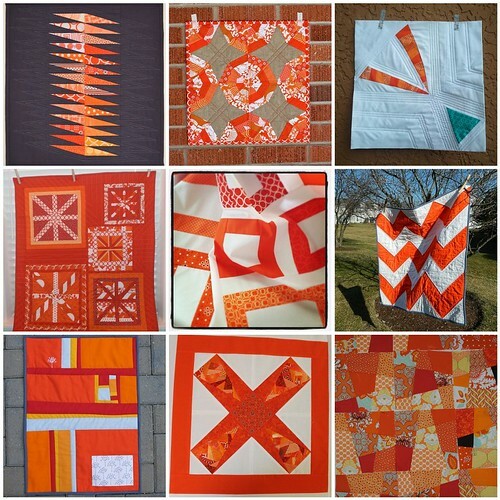 I've been crazy inspired lately and have 3 new quilt patterns in the works. The first should be ready next week. I'm still making the samples for the other 2 and making sure I have the most efficient piecing, so those will probably come in March. 4. Blog design. I'd love to have someone professional redo my blog, but realistically I don't have the money for it right now (more on that below). So I'm slowly doing a slow revamp. You can see my new header & links up already and I'm working on my sidebar. 5. I'm back in school! Kind of... In order to get my Ga teaching license I need to take 3 credits on teaching special education. So I started a class yesterday through the University of Phoenix. It's a 6 week class, so I should be able to get my license before the next school year starts. It's the cheapest class I found, but I forgot how expensive college classes are! Did you make it this far?! Congrats on going for your credits! As for Tangerine Tango, it's growing on me. Can't wait to see your new patterns!!! WOW! You seem crazy busy! Sewing Summit sounds like it is going to be awesome. I am sure you can sneak into some classes!